Alastair Moock is a 2014 Grammy Nominee, two-time Parents’ Choice Gold Medal Winner, recipient of the ASCAP Children’s Music Award, and has twice been voted by the Fids & Kamily Industry Critics’ Poll among the Top 3 Albums of the Year. Long one of Boston’s premier folk artists, Alastair turned his attention to family music after the birth of his twin daughters in 2006. 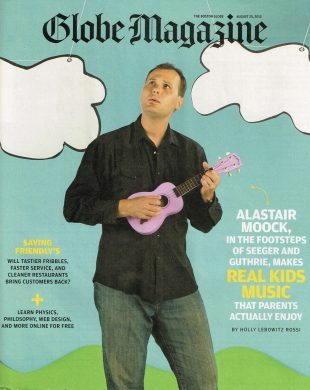 Alastair Moock makes real kids music that parents can actually enjoy. Moock and Friends’ live shows are always rowdy, rootsy, singin’ and dancin’ fun for the whole family!